Mr. Omar Ayub Khan born on January 26, 1970 is a well-known lawmaker and politician of Pakistan Tehreek-e-Insaaf (PTI). He belongs from Haripur District in Hazara region of Khyber Pakhtunkhwa. In the general election 2018, he has been elected as an MNA on a PTI ticket. He was previously elected as MNA for the terms of 2002 and 2014. Mr. Omar Ayub Khan earned BBA and MBA degrees from George Washington University in 1993 and 1996 respectively. During 2004-2007, he held the portfolio of Minister of State for Finance in the federal cabinet. In 2007 he was selected as one of the Young Global Leaders by the World Economic Forum, Switzerland. He is an eminent figure of the Pakistan's political arena and known for his oratory, economic and management skills. Currently, he holds the portfolio of the Minister for Energy (Power Division) in the federal cabinet. Mr. Omar Ayub Khan is the son of veteran politician Mr. Gohar Ayub khan and the grandson of Field Marshal Ayub Khan who was the second President of Pakistan. 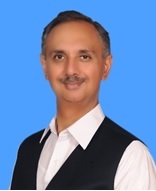 By virtue of his portfolio as Honourable Minister for Energy (Power Division), Mr. Omar Ayub Khan is the Chairman of Private Power and Infrastructure Board (PPIB).